Is far, I haven’t even moved in yet and I already have issues with this place. I recommend being more prepared to deal with slow staff and slow responses before signing a lease here. I am not yet a resident but I will be next year and I’m so excited! I had the best experience signing my lease with the manager who was so nice! It has been an experience. A really good location, and relatively clean. Not as noisy as you would expect with it being right off of Dickson. I Enjoy Living at frisco, every year I have lived here it has gotten better and better! Close to my classes and to Dickson Street. It’s beautiful in the summers! Not the best apartment complex, but it is very central to campus and downtown Fayetteville which is nice. Always loud and usually pretty dirty. 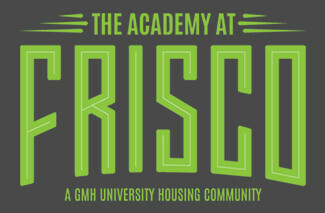 The Academy at Frisco employees are extremely friendly and helpful. The apartments are great and have the best location for off campus living. I've enjoyed living here except for our appliances that keep breaking and after wanting to renew our rate went up which was not ok and that is the biggest reason for not staying. Terrible service. Leaving next yesr. Walked into my room with clothes everywhere. Front desk never told me there was a leak above me and people were coming in. Worked on it off and on for over a month and was never told when people were coming, they came in my room without permission. Asked to be told ahead of time and never was. Great place to live with a wonderful staff and amenities. It’s close enough to walk to campus and close to Dickson. It can be loud and people run up and down hallways yelling, but other than that it’s fine. It’s been a blast. The location is superb and right on Dickson street. We are able to walk to class. There are great food options all around us. I have yet to move into my apartment, but I signed my lease a couple weeks ago. The staff has been very helpful and friendly throughout the whole process, and they were very informational as well. I like my apartment and it's upkeep. The staff is all very friendly. The environment can be loud at times, but besides that the only other complaint I have is my parking being on the fifth floor when i live on the second. Very amazing apartment complex for my first apartment in Fayetteville. Was put with three random roommates and they are great. Very clean apartment with great amenities. The Good: -Great location, super close to campus. -Staff is friendly. Maintenance staff always says hello to me in the halls. -Some nice amenities like game room and gym. -Front office often hands out free goodies. The Bad: -Noise can easily be heard through doors and down the hall. -Studio didn’t come furnished and didn’t find out until I moved in. -Parking situation wasn’t handled well. Signed for a spot on the first floor because I live on the first floor and ended up with a spot on the 6th floor of the garage. This place is very beautiful and well-equiped in comparison with other complexes that I have visited. You have great staffs, great residents. I really enjoy staying here, very close location to basically anywhere. Which is really convenient for me. Great people all around here as well. My experience at frisco has gotten better with time. I recently had a parking situation and the staff was very helpful with sorting that all out. Love the layout of the bedroom and the amount of storage in the bathroom! I also love the living room closet which allows me and my roommates to store excess belongings. I just wish the walls were thicker or had better soundproofing because you can hear everything. The location is excellent, although the furniture and appliances are extremely old and broken. The front desk workers are awesome and will help!